How can better soils help us deliver ecosystem services? LANDMARK (LAND Management, Assessment, Research, Knowledge base) is a European Horizon 2020 Research Project dealing with the sustainable management of land and soil in Europe. The questions that LANDMARK aims to address are: “How can we make the most of our land? How can we ensure that our soils deliver on the many expectations we have of our land?”. Soils provide us with multiple ecosystem services, including the five functions identified by Landmark: primary productivity (food, fibre and fuel provision); carbon sequestration; water purification; habitat provision; and nutrient cycling. Currently, most of the land in Europe is covered in grasslands (more than 60 million hectares) and managed by more than 10 million farmers. Healthy soils are critical to the provision of ecosystem services and, consequently, so is land management. The Landmark project team plans to map both the supply of and the demand for the multiple functions provided by soils using specific indicators and to do so at a European scale. For instance, for the habitat provision function, the supply indicators are species richness, abundance and biomass; and the demand indicator is the degree of maintenance and protection rules applied to the land (ranging from Natura 2000 sites to improved agriculture outside protected areas). 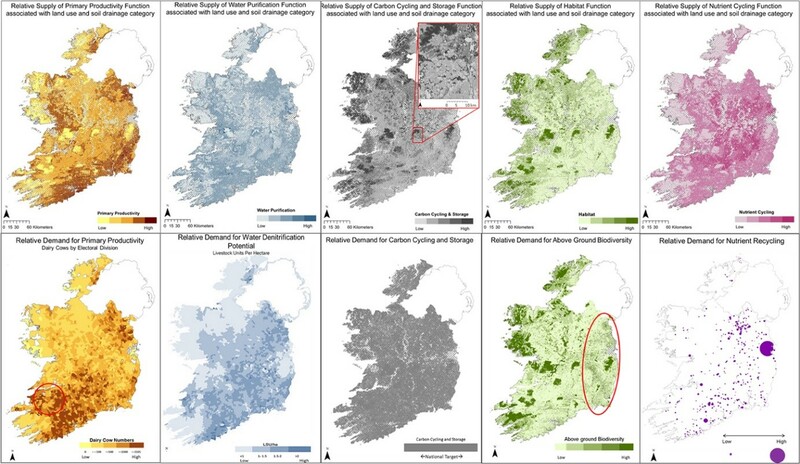 The method developed by the Landmark project has been tested on the Irish scale for now (see maps below) but the aim is to map the whole of Europe. The results of the project should prove interesting to all land managers. Of particular interest could be the maps of grassland productivity or ones that identify areas with potential for sustainable intensification for example. The functional land management recommendations that emerge from the project will be used to shape EU policies. Different policies have already been implemented to reduce threats, such as erosion, compaction, loss of organic matter, pollution to soil. However, in 2014, the European Commission decide to withdraw a proposal for a Soil Framework Directive so there is currently no comprehensive and coherent set of rules for soil management across the EU. However, the soils thematic can be found in a certain number of policies, as explained in the Landmark publication from December 2015 in Frontiers in Environmental Science, “Making the most of our land: managing soil functions from local to continental scale”. For example, the Common Agricultural Policy includes mention of soil primary productivity, biodiversity and carbon sequestration; the Nitrates Directive includes the issues of water purification and nutrient cycling; the Habitats and Birds Directives speaks to the issue of biodiversity; etc. The Landmark project results are relevant for the PEGASUS project, which defines “soils functionality” and “soil protection” as two environmentally and socially beneficial outcomes from agriculture and forest ecosystems. Policy recommendations to stimulate the provision of benefits related to agriculture and forestry land will be made available by the PEGASUS project in 2017.